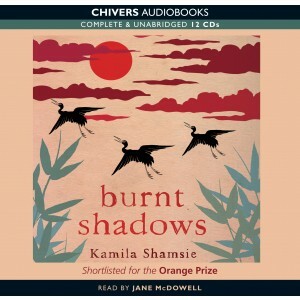 Burnt Shadows, by Pakistani author Kamila Shamsie, was nominated for the Orange Prize in 2009. Ambitious in its scope, it is a compelling novel that loses its way at the end. Capably narrated in this audio book edition by Jane McDowell who only occasionally confuses the multiple accents she has to portray, Burnt Shadows is the story of Hiroko Tanaka, who survives the Nagasaki bomb blast but loses everything she holds dear. This novel vividly portrays the profound bewilderment that people must have felt when they emerged into the devastation and saw nothing of what had been there before. Ostracised by her own people as one of the Hibakusha (explosion-affected people) she moves to Delhi in pre-partition India to visit the family of Konrad Weiss, the German translator she had agreed to marry on the day of bomb blast. Although not really made welcome by James Burton, a British diplomat, Hiroko becomes a semi-permanent guest – and friend to Ilse, his discontented wife. She gets work as a translator, and despite her reserved nature, gradually forms an attachment to Sajjad Ashraf, who works for the Burtons, and teaches her Urdu. Although the eerie marks of the bomb blast are confined to her back, Hiroko does not expect to marry and her reaction to Sajjad’s tentative and respectful attentions is to angrily remove her shirt and show him the scars. Inevitably, this scene is interrupted and misinterpreted and Sajjad is given his marching orders. Rejecting the arranged marriage expected of him by his Muslim family tradition, Sajjad and Hiroko elope to Pakistan, and find themselves stranded there under new residency rules under Partition. These events give Shamsie the opportunity to strengthen the contrast between Hiroko as one who adapts to become a citizen of the world , and Sajjad who pines for his homeland. Over the 60 year span of this novel, Hiroko belatedly has a child, Raza, who is naïve to the point of stupidity. Through a friendship with Abdullah, a street-kid in Karachi, as an adolescent he ends up in a training camp for the Mujadahin and (rather unconvincingly) survives when they discover that no, he’s not an Afghan refugee from the Soviet Occupation. This stunt does ends in tragedy, however, leaving Hiroko a widow and Raza with a (well-deserved) sense of guilt. It is when the novel switches its focus to America and its adventures in Afghanistan that the novel loses its way. Scenes in Japan, India and Pakistan resonate with authenticity: the sights, the scents, the noise and confusion, and above all the carefully woven strands of a mixed marriage and the compromises it brings. But Shamsie’s Afghanistan is nothing more than the training camp and later a US stockade for CIA operative Harry Burton and his translator Raza to enact the next tragedy. Canada, offering escape from American immigration precautions, is just a road and a service station, and Hiroko’s strong personality seems deflated in her anonymous New York apartment, as if she is just there so that she can deliver a dressing-down to Kim, Harry’s daughter, when her suspicions of Muslims after 9/11 lead to Tragedy Part 3. The plot becomes servant to the political message rather than a fluid consequence of what has gone before, and this is in part because the small cast of characters have had to bear more weight in this novel than they can credibly provide. Still, Hiroko’s conclusion is a point worth making: even in war, the individual does matter. All you have to do to air-brush away collateral damage, she says, is to put the people who will be victims ‘in a little corner of the big picture’. Do the ends justify such means? The debate about the rights and wrong of the second bomb remains unresolved, as is the case for locking up terrorism suspects in places like Guantánamo. As I write, President Obama is still trying to close it, so far without success. PS Laura reviewed it at her Musings too. PPS 29/6/13 There is an interesting discussion of this book as a ‘widescreen’ novel at Kevin from Canada. I really liked this book but agree completely that it lost its way in the final segment. Up to that point, I was hooked! Yes, that was the disappointing part, and it was probably more pronounced in an audio book where I found myself drifting away from the narrative – which up till then had had me completely captivated. I’ve added the link to your review above. BTW I found out why I didn’t find your review in my usual search, you hadn’t tagged it with the title and author’s name. Lisa, it’s funny you mention tags because when I posted my first comment I noticed your extensive use of categories & tags. I’ve actually been mulling over my tagging scheme recently — it’s really rather spartan. I like the idea of tagging by author. What other sort of tags do your recommend? And how do you differentiate tags and categories? Oh Laura, I’m no expert! I think I add too many tags sometimes – Google doesn’t like more than 10-12 per post, I think. But I think it’s essential to tag at least with the author’s name and the name of the book because that’s what people type into a search box. Some of my tags are there to help my readers find stuff, e.g. if you click Indigenous Authors or Debut Australian Fiction in my tag cloud, it will find all the posts that have that tag (and the Tag Cloud gives first time visitors an indication of my interests, the bigger the font, the more I’ve posted about it. Some of my tags and categories are there for my own use e.g. to help *me* find all the books I’ve read for 1001 Books, or how many French books I’ve read and so on. I take care to track author gender using categories, for instance, and am pleased to say that it hovers around 45:55, always more male authors so far because I read so many 19th century classics, but still a respectable balance overall, I think. Thanks a bunch Lisa! I’ll give it some thought. The idea of retroactively re-tagging is rather daunting but I can at least develop a new approach going forward. Then over on the RHS you will see a little number saying how many there are. Click on that and they will all come up in a list. If you hover underneath the title on the LHS you will see Quick Edit. Click that and delete Booker Prize out of the Tag Box, and type Man Booker Prize. Then copy Man Booker Prize. Click on each title, and paste Man Booker Prize over the top of Booker Prize and (unless you have squillions of them) you will be done in no time. And if you wanted to add them to a category, say Award Winning Books, you could do that at the same time. Oh my goodness, I really did not like Burnt Shadows at all – the plot was so implausible and, precisely as you put it, subservient to the thinly veiled rantings of the author about the futility of war. How she managed to weave all the major events of the 20th century and beyond,, while maintaining a cast list of barely 6 or so, I do not know. I guess that’s the point… she really didn’t pull it off. Not by a long way.